Recently I have had to re-examine and change my stance on people swimming with dolphins. Here in Hawaii, our near-shore spinner dolphin populations have been in severe and steady decline due, in large part, to the upsurge in human-dolphin activities in the past 15 or so years. A variety of local conservation groups and individuals along with the National Oceanic & Atmospheric Association (NOAA) who, by the way, is taking the forefront, will be imposing new regulations (I have met with NOAA's biologists who are putting together the environmental impact statement which will lead to stiff, enforced regulations for human harassment of dolphins, will be enforced, and will impose a hefty fine and a felony charge.) The environmental impact statement (doesn't it always seem to go this way?) has been postponed several times, but just in case you're planning on a dolphin retreat or seminar or swim, you may want to rethink it. 4. Because of the huge upsurge in human/dolphin interactions, whether it be from eco-tours, dolphin retreats, casual dolphin swims, etc., the dolphins ARE NOT GETTING THE REST THEY NEED (from 10 am to 2 pm is absolutely critical sleep time for them) AND ARE BEING MADE INCREASINGLY VULNERABLE TO SHARK ATTACKS, especisally cookie cutter sharks which leave round scars AT NIGHT WHEN THEY FEED. While an adult dolphin can withstand a bite, perhaps two, the babies are extremely vulnerable, tire easily at night, and are not surviving. In other words, the dolphins are literally being LOVED TO DEATH. 5. If current trends continue, it is highly likely that there will be no more near shore spinner dolphin pods in the next 5 years. I don't know about you, but that is not a future I'd like to see. By the way, since I get told this a lot by people who are intent on swimming with the dolphins due to their own agendas and don't want to even look at the possibility that they are causing harm, this is not my opinion; this is based on years of empirical data. If I were to ask you if you love the dolphins and your answer was "yes", and then I were to ask you if you knew that your behavior was having a negative impact on them, and your answer was "yes," and then I steered you to read the undeniable, irrefutable data available and you still chose to swim with them, then the only conclusion I would be able to draw is that you are choosing to do so with the full knowledge that your behavior is destructive to an animal that you supposedly love. An interesting and very well-written article came out in the December 2006 issue of The Hawaii Island Journal that I am including below and encourage you to read. I also hope that you will find a way to take some kind of positive action that feels comfortable to you, whether it be taking this information to heart and re-thinking the way you interact with the dolphins; passing this on to others (friends, family, colleagues, etc. ), or contacting NOAA to let them know how you feel and to urge them to take IMMEDIATE ACTION . If you still choose to swim with the dolphins, whether on your own or as part of an organized eco-tourism or dolphin retreat or seminar group, I urge you to use your common sense and think about how you interact with them. Remember, these are WILD animals. For example, when the dolphins first come into the bay early in the morning and when they leave the bay late in the afternoon is when they are more likely to be sociable and want to play (however, even this behavior has changed as the dolphins have had to adapt their sleep time around humans). They will be talkative, boisterous, leaping, spinning, etc. During the hours of approximately 10 am to 2 pm (and this isn't written in stone, folks! ), the dolphins will be resting. They will tend to swim in circles, staying close to the bottom, but come up to breathe. You won't hear them whistling, squealing or clicking much. They will be subdued. This is the time to GIVE THEM THEIR SPACE, especially if you get tail or head slaps, as this is a dolphin saying, "stay away"! Another thing to keep in mind is that when you visit Hawaii you are a GUEST of the Hawaiian people, and it is a good thing to respect their cultural values and beliefs. Swimming with dolphins is TOTALLY AGAINST NATIVE HAWAIIAN CULTURAL VALUES, and I can tell you from living here that the local Hawaiian people are VERY angry about what's going on. On any given day at Honaunau Bay in South Kona, one might witness an increasingly common sight: a pod of Hawaiian spinner dolphins, nai'a, swimming in a slow, synchronized pattern above the sandy bottom on the north side of the bay, surrounded by upwards of fifty noisy human swimmers with masks, snorkels and various types of colorful flotation devices. How one might describe this scene depends on one's perspective. Are these insensitive humans intruding into the dolphins' daily rhythm? Harmless tourists having fun with these charismatic creatures? Earth-dwellers communing with dolphin extraterrestrials? Commercial tour companies exploiting the dolphins for profit? Western self-absorption clashing with traditional Hawaiian practices of leaving the nai'a alone? New Age seekers who see dolphins as higher beings? All of these points of view, and more, were expressed by members of the public testifying at the recent scoping meetings held around Hawai'i by the National Oceanic and Atmospheric Administration. NOAA has the mandate, under the U.S. Marine Mammal Protection Act, to ensure dolphin safety, and authorities say that there is increasing evidence that spinner dolphins are threatened by the constant attention from their adoring public. The National Marine Fisheries Service (NMFS), an agency of NOAA, has proposed one regulatory approach and four alternatives. The schedule, which involves an environmental impact statement (EIS) process, would see any new rules being adopted in 2008. For many of those who spoke at the Hawai'i Island meeting in Kona, that's not soon enough. "This [dolphin] harassment needs to be stopped before somebody gets hurt," said Leinani Navas-Loa, who introduced herself as a Hawaiian who was raised in the ahupua'a of Honaunau and whose family has always included lawai'a (fishermen). "Our beach has been exploited by people who want to make money," Navas-Loa testified. "The headlines of their ads say, 'Swim with the dolphins.' As keiki growing up at Honaunau beach, we were taught by our parents and our kupuna to respect everything that was around us . . . the nai'a have always been in the bay, and they were left alone." 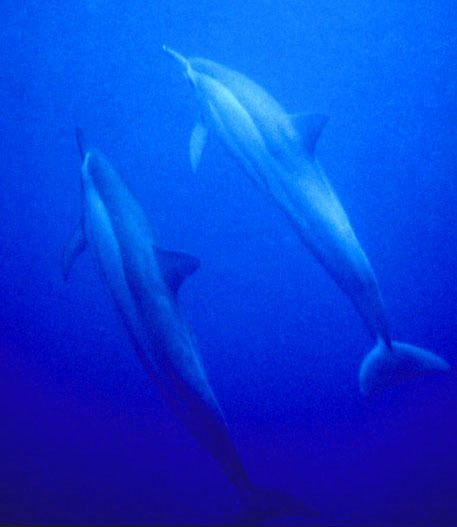 The Maoli (aboriginal) tradition of allowing the spinner dolphins their undisturbed space in the bay (testified to by several Hawaiians at the meeting) has its roots in a deep understanding of the natural world. Hawaiian spinner dolphins spend their nights in a high-energy hunt for food. They specialize in foraging on small mid-depth fish, shrimp and squid, averaging an intake of up to four prey items per minute for ten hours or more. It's an intense, high-caloric expenditure of energy that is balanced by their daytime periods of rest. Soon after dawn, the dolphins head for shallow bays close to shore where they can rest, avoid sharks and other predators, socialize and care for their young. In their resting mode, they do not appear asleep, nor are they motionless; they move slowly and synchronously back and forth, swimming in formation as they attend to their social needs and recharge for the coming "night shift." Several scientific studies have now documented that human interactions can disturb and alter spinner dolphin behavior. The clearly defined resting periods and the geographic specificity of the habitual resting areas make the dolphins particularly susceptible to the effects of frequent, prolonged, and intrusive presence of humans. "One of the most common objections we hear to regulating human-dolphin interaction is that the dolphins can choose to swim away if they don't like it," says NOAA's Chris Yates. "But if they are forced to leave their rest area to escape human disturbance, there are a number of potential effects that can be detrimental to the dolphins." These effects include shorter rest periods that lead to compromised foraging efficiency, and reduced energy available for growth and reproduction. If dolphins are driven from their resting areas by humans wanting to experience "closeness" with them, the dolphins may also be forced into areas where they are much more vulnerable to predators. In one study of bottlenose dolphins, researchers found a direct correlation between dolphin-watching tours and significant reduced dolphin populations. Although that connection has not been firmly established for Hawaiian spinner dolphins, recorded observations of fewer and smaller pods in Hawai'i's waters have sparked concern that the rapid increase in "swim with the dolphins" activities in Hawai'i is having a negative effect on dolphin populations here. Steve "Kiwina" Soto-Amundson, of the dolphin protection organization "Malama i Na Nai'a," testified at the O'ahu hearing that "our records, witnesses, data, and testimony from the Kona Coast experience with spinner dolphins reports a dramatic increase in injuries to spinner dolphin young, dramatic increase in the number of eco-tourism companies and activities and the dramatic decrease in the number of visits to primary daytime habitats and to the overall numbers of spinner dolphins in our pods. This same result was reached by a NOAA-sponsored study made public in 2003." Studies in Australia have shown that human disruption from tour operations causes a demonstrable negative effect on dolphin populations due to alteration of reproductive patterns. Consequently, the Australian government (which already licenses and closely monitors dolphin tours), reduced the number of licenses for the affected areas. Currently, dolphin tours on Hawai'i Island are neither licensed nor monitored by any government agency. "Culturally, it is incorrect to be swimming and playing around with the nai'a," said Jimmy Medeiros, who lives at Honaunau Bay. "This is not Jamaica, Florida, or any other part of the world. It's very hard to be a Hawaiian and see what is happening with the nai'a." Damien Kennison, who lives at Ho'okena Beach, reported seeing people chasing dolphins, hanging onto their fins and pursuing them until they are forced to leave the bay. "I don't think that's very good way to show that you love and respect them," he said. "It's very maha'oi-very rude." Doug Hackett and Trish Regan operate Dolphin/Spirit of Hawai'i, a dolphin tour company that offers seven-day dolphin retreats for $1,840. Hackett testified that he believed, after a conversation with the late Lanakila Brandt, that Hawaiians did not regard dolphins as aumakua, (benevolent ancestral spirits). That testimony was strongly rebutted by Maoli, who testified to the fact the nai'a were, in fact, family aumakua. "What makes these people think they can come to our place and disrespect what our kupuna and parents have taught us?" asked Navas-Loa. Charles Kealoha Leslie, who has lived his whole life in Napo'opo'o, testified about the negative effects on his livelihood from the dolphin tourism in Kealakekua Bay. "I feel my traditional rights as a native Hawaiian practitioner of fishing-lawai'a-have been affected and that there is no solution using the current approach," he said. "There have been no akule in the bay for three years." Leslie says that he has seen 100 double kayaks in a single morning, not counting the midday and afternoon rounds. "My native Hawaiian family always told me the dolphins were to be left alone," he said. "Yet daily I watch this trespassing go on unheeded, and the kayaks make it much easier to reach them." In New Zealand, where swim-with-dolphin programs also exist, the Department of Conservation has an internal agency staffed by Maori and is mandated with providing Maori cultural guidance in resource conservation issue. But neither the State of Hawai'i nor the U.S. government has yet made any serious attempts to identify the Hawaiian cultural and traditional sustenance issues related to marine mammals and incorporate those findings into policy. The draft EIS (to be written by NOAA) will most likely examine this issue in some depth, as state law now requires that environmental impact statements and assessments must "identify and address effects on Hawai'i's culture, and traditional and customary rights." The state Department of Land and Natural Resources, in its official statement of support of NOAA's current efforts to look at possible dolphin protection measures, does cite the "revered nai'a of traditional Hawaiian culture." Google the phrase "swim with dolphins Kona," and you'll get hundreds of sites. Several Hawai'i Island dolphin-experience businesses can be found online, offering everything from "dolphin assisted birth preparation" to a guided communion with dolphins that are described as "telepathic, tantric beings"-all for a hefty fee. These excursions cost anywhere from $134 per person for the day to $2259 for a 6-day package that includes a "forgiveness ritual" at Pu'uhonua o Honaunau National Historical Park. One site offers a 7-day dolphin "E.T. Seminar" for $1550. Most sites eagerly assert up to a 99 percent success rate in providing a close dolphin experience. The Kona scoping meeting was the largest of the four statewide hearings, with 200 packed in the room. About one-third of 45 people who testified opposed new regulations aimed at protecting the dolphins from human intrusion. All but one or two of these were dolphin tour operators or those who in some way sell dolphin experiences. Worldwide, "nature tourism" is on the rise. The World Trade Organization estimates that the direct economic impact of global nature travel runs into the tens of billions of dollars. With that kind of money at stake, it's easy to understand that some nature tourism outfits have a greater focus on proceeds than on protection. From polar bear excursions in Hudson Bay to sea-turtle adventures in Gabon, there is mounting evidence of habitat destruction and harm to specific species by irresponsible nature tour operators and overenthusiastic tourists. In New Zealand, where swim-with-dolphin programs have drastically increased over the past ten years, the government is attempting to find ways to regulate these activities to mitigate their negative effects. The New Zealand Department of Conservation's new "Marine Mammal Action Plan for 2005-2010" lays out several strategies to "Protect against present or future cumulative effects of tourism. Suggestions include restricting permits, and working with the tourism industry to develop "best practices" guidelines and "robust monitoring." In New Zealand, commercial swim-with-dolphin operators must have permits, and the number of permits is strictly limited. Some areas are entirely closed to dolphin-swimming tours. Although no comprehensive studies have yet been completed in Hawai'i on the socio-economic impact of dolphin-swim businesses, tempers have flared repeatedly on the Wai'anae coast, where dolphin tour operators claim that they are enhancing the economy of the area by providing jobs and bringing in more tourists. Wai'anae fishermen say that any such economic benefit is negated by the marked decrease in their akule catches caused by the tour boats breaking up the schools of akule. The fishermen claim thousands of dollars in losses. Soto-Amundson testified that if NOAA does not move forward with new regulations and enforcement to protect Hawaiian spinner dolphins, Malama i Na Nai'a is prepared to litigate the issue. "We hope it never comes to this, as all that's being asked here is to leave the spinner dolphins alone-and to have those of you who financially gain from imposing your will on the dolphins to find some other way to exist here in Hawai'i," he said. Much of the testimony offered by dolphin-tour operators focused on their own personal transformative experiences with dolphins and their feeling that it was their right to maintain that connection and offer it to others. Angelika Whitecliff of the Exopolitics Institute (an organization that views dolphins as extraterrestrials) came to Hawai'i Island after a meditation at her home in Berkeley, California. In that meditation, she said, "cetaceans came into my awareness," and told her to come and swim with them. "They called me ... they have transformed my life," she claimed. "They've given me so much information on the multidimensional level." Michael Hyson of the Sirius Institute (an organization whose mission is to create the "dolphinization of the planet" and the "humanization of space"), claimed that the dolphins are reaching out to humans and that swimming with wild dolphins has helped people regain their vision, beat depression and cure autism. Many operators passionately believe that the dolphins were "choosing" to interact with them and their clients. California computer scientist Dr. David Cole is one dolphin researcher who is working to unlock the mystery of dolphins' apparent abilities to have a therapeutic effect on certain kinds of human ailments. According to Cole, the explanation is not in vague New Age theories of dolphins as extraterrestrials or higher beings but in their echolocation abilities, their sonar. His findings indicate that a dolphin's sonar can cause a phenomenon called cavitation, a ripping apart of molecules. If dolphins are causing cavitation inside the soft tissue in the human body, including cellular membranes, the dolphins' sonar could even alter biomolecules, he says. Some dolphin-sonar researchers have expressed concerns that as more and more people hear of dolphins' apparent therapeutic effects, the desire to exploit the animals for a quick buck will spread, and dolphin populations will be threatened by both captive dolphin-therapy programs and burgeoning numbers of people clamoring to swim with wild dolphins. Despite the passionate and divergent feelings expressed by community members about human-dolphin interactions, the primary regulatory approach proposed by NOAA - identifying dolphin resting areas and times of rest and prohibiting people from approaching those places during those times-seems to have the widespread support. Dr. Jan Ostmann-Lind is a researcher who specializes in marine mammals, has worked with the National Geographic Society and the Steinhart Aquarium, and currently heads Kula Nai'a Wild Dolphin Research Foundation. He recommends setting aside resting areas whenever that dolphins are present, describing a scenario of operators hovering just outside the rest area limits and swooping in among the dolphins at the moment when the kapu period ends. Many said that NOAA needs to focus on the overall situation, not just on swim-with-dolphin programs. Kona dolphin tour boat skipper Doug Webster, who blogs on "ETfriends.com" asks why NOAA officials, who also have regulatory control over the killing of dolphins by tuna fishing fleets and the potential harm to dolphins by the Navy's use of high-intensity sonar use, are not flexing their muscle to protect dolphins from these threats. Other speakers cited the need to look at near-shore land use and water pollution issues. Several speakers said that although they opposed commercial dolphin swimming operations, they were also leery of the federal government's motivations and ability to actually enforce any new rules. In the gulf that separates the conflicting camps lie questions that aren't easily answered. Are the dolphins more worthy of being ensured an uninterrupted rest, or are humans deserve to use dolphins as part of their search for personal enlightenment and pleasure? And who is to be the judge? For the majority of those who testified at the October meetings, the precautionary principle was the one that best applied here. Maggie Connor testified that she has often seen swimmers chasing dolphins; she also notes a decline in dolphin population. "It's tremendously disturbing," she said. "It's time to take responsibility, keep the dolphins from being loved to death. "Wouldn't it be great if in the future, if we're all lucky enough to be here, to look back and say, 'remember when the pods were only 30, 40 dolphins-and now they are 100 or 150? And to be able to say that we did the right thing then, we took a stand to protect them." DLNR officers recently assigned to Kealakekua Bay, and the new warning buoys around Captain Cook Monument, are not there there primarily to protect dolphins (though if people harass dolphins in sight of a DLNR officer, they'll probably get what they deserve). DLNR officials say they took the actions to protect people in the wake of the October 15 earthquake, which caused landslides in the area. Kayakers may still paddle in the outer bay, but not land at the monument or to venture into the inner bay near the cliffs (a prohibited activity in any event).